Last month, 14-year-old Artem Smao was selling newspaper subscriptions to fundraise a trip to Tahoe, a popular West Coast ski destination. In a twist of events, the California teen ended up donating all of his money to a complete stranger when he knocked on Robynn Fried’s front door. Fried, a Lodi resident, told CBS News in Sacramento that she was unemployed at the time and two weeks away from being homeless when Smao approached her for a donation. When she explained that she could not afford to, the teen did not hesitate to hand over his envelope full of cash. Less than a week after Smao’s act of generosity, Fried was offered a job and said she wants to take the 14-year-old out to dinner to thank him. Smao isn’t the only teen who has gone out of his way to brighten someone else’s day. Last July, four teens from Montana were on their way to a basketball game when they stumbled upon a wallet that was filled with $700. They returned the wallet completely intact before the owner even realized it was missing. “We decided if we’d lost our wallet, we would want somebody to return it,” Kaylee Olson, one of the 14-year-olds, told the Great Falls Tribune. In March, another teen, 18-year-old Samantha Manns, set off to accomplish 89 random acts of kindness in honor of her 89-year-old grandmother who passed away. What do you think about these teens and their acts of kindness? Sound off in the comments below or tweet @HuffPostTeen. I was sitting at a Starbucks — just me, my computer and some tea. I glanced around to see an elderly woman with her (I’m assuming) granddaughter, two men dressed to the nines, a handful of baristas cleaning up to close for the night. Time passed, I read some stuff, wrote some stuff, just like every other night. The other customers left and soon enough I felt threatened enough by the employee stacking chairs onto tables that I, too, left. Maybe this is the beginning of my slow descent into insanity, but it felt more so (hopefully) like a moment of recognition, as if to say, “I’m here, I exist, I’m real.” My simple self-directed greeting unleashed a flood of emotions for a reason I cannot explain except that I have the unique ability to be consistently overly dramatic (I’m hoping this will prove to be a major strength at some point in my professional life). My vocal cords’ inactivity got to me, made me feel like I didn’t have a say, for lack of a better word, a voice. It was only after a chat with a good listener of a friend that I was able to identify this bizarre emotion to myself. I was lonely. There, I said it. I was lonely, isolated, sad, any of those other words we all feel but have fears about admitting to. Once I said it, realized it, became okay with it, everything seemed better and I think it was because I realized what made me feel this way. In simple terms, it was the absence of speaking that bothered me so much. I needed people, interaction, not just observation. I needed a more external release of joy than just typing words on a page all day long. In a very roundabout way, this small epiphany of a moment helped me start to understand how important it was for me to have that outside happiness, those joyful moments spent with others. But then I had a slew of conversations with my fellow 22-year-old lost compatriots who felt exactly the same way that I did. Momentarily, this made me feel better, that I wasn’t alone in feeling alone. But there was something in common between all of us, a lack of balance. We are ambitious, we don’t want to sacrifice opportunity for frivolous things like, you know, fun. However, contrary to a recent college graduate’s beliefs, fun comes in all forms. We are all unique and for all of us, finding those fun things, those pleasurable moments that make the day not one of loneliness or monotony comes about differently. Whether it’s playing your favorite song forty times or making an effort to have some good old fashion conversation, we can all find our moments of happiness that will alleviate that forsaken loneliness. I thought about this more and more, about what plagues us into thinking that we can go through days without sometimes even an ounce of joy. More often than not it’s ambition — ambition to provide, ambition to succeed, ambition to impress. Ambition is amazing, I would be lost without it as would most of us who rely on some sort of self-motivation. So I thought about my own ambition, and how that was maybe getting in the way of these moments of joy I found myself now craving. Then as quickly as I had realized my flaw, my need, my missing link after that night at Starbucks, I realized at this moment of reflection on my apparently prohibiting ambition that I had nothing to worry about. The specific happy things will come, they’ll make their way into our lives through all sorts of paths we could have never conjured up, so there’s no point in manipulating them. But I think that there’s only room for those joyful moments, those happy things that keep us balanced and sane and hea lthy, when the regular grind of life is something worthwhile and rewarding. Rewarding means different things to everyone and I am in absolutely no place to define it for anyone but myself. Although I think that there needs to be that light at the end of the tunnel, that goal we have, even if it’s so far-fetched we will probably never reach it. Ambition is good, it’s what makes us who we are, it’s what defines our choices. I want to believe at least that the happy moments will find their way into that path of ambition when that path has some semblance of pleasure and worth on its own. I feel lucky that I get to wake up every day and do what I love to do, even if it means being lonely sometimes. I don’t think anyone can ever claim perfect happiness. If we can find those bits of joy in our daily life, and they don’t have be grand gestures or inconvenient efforts to be totally content, I’d hope that we can all get one step closer to whatever that imaginary light down that tunnel is. 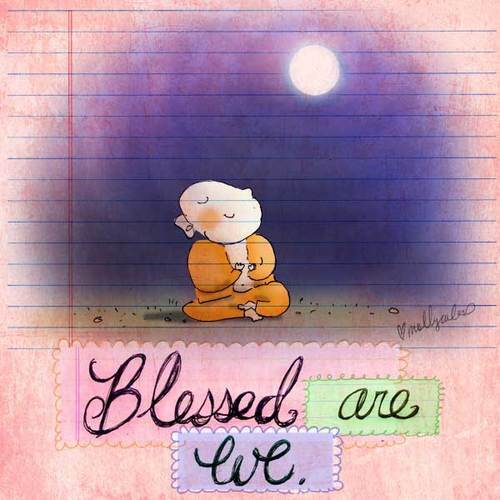 It may take a brief moment of talking to ourselves in the rear view mirror, or finally being able to admit that we aren’t perfectly blissful all of the time when we should be, but that’s okay. Maybe all that it takes to mine that joy out of the daily grind is recognition that we are doing what we are meant to do, what we have to do in order to keep the beautiful things in each and every one of our lives going. HooplaHa – Life with a Smile is back in action with a new campaign that showcases good deeds everywhere! The #GivingVine is an ambitious social engagement initiative that encourages acts of kindness. Individuals can capture these acts using Vine, Twitter’s new iPhone service that allows you to record and share six second looping videos. In conjunction with the #GivingVine, HooplaHa has also launched an Indiegogo “crowdfunding” campaign where all funds raised will go directly into achieving our ultimate mission of making the world a happier place. For every $100 that is raised via Indiegogo, Team HooplaHa will be performing acts of kindness throughout the community that we will add to the #GivingVine. You can do anything from bringing greeting cards to a local hospital, to leaving your favorite book for someone in a public place, or even as small as buying the person behind you in line coffee. Keep your eyes peeled — you never know where we’ll pop up! You can watch the #GivingVine grow by following HooplaHa on Vine or by going to HooplaHa.com/GivingVine. Why not join us in promoting positivity? HooplaHa is welcoming everyone — from our best friends to people around the globe — to create Vine videos performing acts of kindness. Be sure to use the hashtag #GivingVine and show us how you spread smiles! The inspiring story of a Utah Chili’s waitress who “fixed” a sliced cheeseburger for a young girl is just one more example of how a simple act of kindness can have a large impact. But when the meal arrived, something was wrong: The burger was “broken,” Arianna said sadly. “Automatically we cut it in half so it’s easier for the kids to eat,” the family’s server, Lauren Wells, explained later to CBS affiliate KUTV 2. While some servers might have laughed off Arianna’s reaction as childishness, Wells immediately ordered a new (and unsliced) burger for no extra charge, after MacLean explained that Arianna had an autism spectrum disorder. When Wells told manager Brad Cattermole about the situation, he too went over to Arianna and apologized for the mishap. MacLean was so impressed by the Chili’s staff’s reaction that she posted the whole story on the chain’s Facebook wall, along with a picture of a happy Arianna kissing her new, fixed burger. By understanding the situation and acting with professionalism and compassion, MacLean said the Chili’s staff literally saved the rest of Arianna’s big day. The picture of Arianna kissing her cheeseburger has since been shared over 130,000 times on Facebook, and has racked up over half a million likes since it was posted Sunday. My name is Alyssa Silva and I am a 22-year-old aspiring writer. 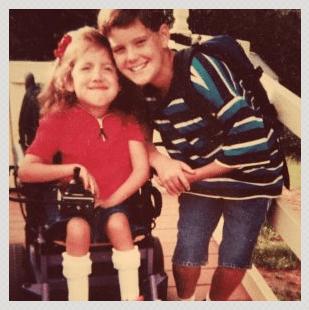 When I was five-months- old, I was diagnosed with a disease called Spinal Muscular Atrophy. It is a debilitating disease that causes severe muscle weakness and affects my overall physical well-being. However, this doesn’t stop me from living my life to its fullest. I started a blog in hopes of spreading awareness on my disease by sharing my personal stories with everyone. I hope that my posts will educate others on what living with this disease is like and inspire those who find themselves in difficult situations. I’d like to dedicate this post to someone who has always believed in me throughout the years. Whether I’m sick in the hospital, need someone to take me to school, or just want someone to talk to, this person is there for me no matter the circumstance. I’m not sure what I did to deserve such a special guy, but I’m so grateful for having him in my life. This one goes out to my best friend and brother, Adam. By all means, Adam and I have your typical older brother/little sister relationship. We laugh, we argue, we get along, we fight; you know — the usual sibling “stuff.” More often than not, Adam finds some clever way to poke fun at me, and I always find myself using a less-than-witty remark as my comeback. It’s a little annoying, but hey, that’s what big brothers are for, right? Nevertheless, in addition to the traditional relationship the two of us share, Adam has given me nothing but the love and strength I need to move forward. I couldn’t help but chuckle when I first heard this story. Because, seriously, how cute is that? Then, I realized Adam has been this way all along. Okay, so maybe we haven’t found him in a corner crying and asking Santa to take his toys back since that night. But, to this day, Adam has always done everything in his power to make sure I’m happy and healthy. From holding my hand during those daunting doctors’ appointments to canceling his plans to take care of me, he has given me every reason to believe that he really is the best brother ever. About 12 years ago, the tables were turned and for the first time in my life, I was worried sick over Adam. One September afternoon, I was receiving an albuterol treatment to keep my lungs expanded and free from infection, something I used to do on a daily basis. Suddenly, there was a knock at our door and my mom rushed to open it. It was a police officer to tell my mom Adam had been hit by a truck while riding his bike. The prognosis didn’t look too promising, and the police officer escorted my mom to the hospital before it was going to be too late. The first three days Adam was on life support, and the doctors had very little hope he would pull through. He had fractured his femur and skull in several places and had internal bleeding. As hard as it was, my parents were told to say their goodbyes in case he wouldn’t make it through the night. Although the news was grim, we all held on to our strong faith in hopes of Adam seeing better days. Night after night he fought for his life, and slowly began getting stronger as time progressed. He ended up spending two weeks in the hospital and a few years gaining his stamina back. Adam was one of the lucky ones, and I can’t even begin to think about what my life would have been like without him. Adam, you’re braver than most people I know. Not only have you gone through your own hardships, but you have always stayed by my side through my adversities as well. You’ve showed me what it means to have courage, especially during those days when giving up seems like the only option. Thank you for doing all that you do to help mom and dad out with my needs. Thank you for encouraging me to start this blog. And, most importantly, thank you for being my number one fan. This post originally appeared on Alyssa’s WordPress blog. To read more of her work, click here.